Well, as promised, here are some of the things I found at the flea market on Saturday. We had such a great time and found some interesting items. It was good to be out junking again! It's been a while. The picture above shows only part of the goods. I spread them all out on the kitchen table, but couldn't get a good shot. So, there are some closer shots below. All of these cabinet cards were just $1 or $2 each. There's some old seam binding, buttons on cards, vintage children's barrettes, earrings that I'll take apart and make into found object jewelry or use on a collage or other piece of art. I was thrilled to have found the two hand mirrors to add to my collection. I'm slowly acquiring enough to do a wall of old hand mirrors in the bathroom. Someday, when it's complete I'll snap a picture. I have quite a collection of vintage barrettes for some reason. I am just drawn to them. I don't have a daughter, but if I ever do, she will surely wear these in her hair! 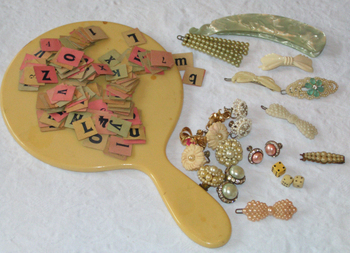 The old cardboard alphabet pieces (above) were a rare find. I 've never seem them in these colors...my very favorite colors! Oh, and these cute dice are teeny tiny, about half the size of standard dice. You can see more detail here. The black and white signs are old advertising signs from Woolworth & Co. Just 10 cents for a photo album, back in the day! The little doll I just had to have. She needed a new home. The fork is from a man who had a whole booth of old flatware that he had bent, pounded, and drilled through to make wind chimes, bracelets, wall hooks and many other items. This fork is intended to be a plate stand, but I'll probably prop a photo on it. And a closer shot of the detail on the Deco period hand mirror. I love this mirror. There are a few more items to show you, but I'll save them for another day. Happy Monday everyone! you just made my morning! what pretty finds. old flowers and papers and sparklies - lucky you! looks like you had a really good flea market day. I had to enlarge the top picture because the one of the family looked like mine!! But it isn't. I have one very much like that. Enjoyed looking at your pictures. I go to the thrift store about twice a week, and when the weather is good, garage saleing as much as possible. Just love finding stuff, even if I don't know what I'am going to do with it. Love all your finds! What fun! Wonderful finds! I collect vintage barrettes too. 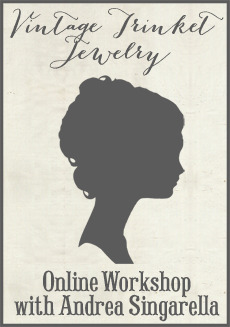 My 15 yr. old daughter loves vintage clothes and jewelry and I always look for vintage barrettes for her to wear in her hair. The ones you found are gorgeous! I adore the little stationery and photo albums signs! 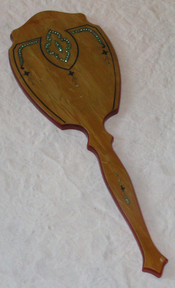 I bet a wall filled with old hand mirrors would be beautiful! Wow, your finds are staggering and the colours of them all tone so beautifully in your photographs! 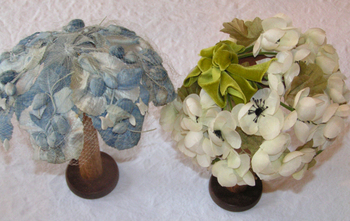 I am a huge vintage hat fan and love to buy the mad floral ones like yours. can i be a total copycat and start collecting vintage hairclips too? i love the idea, and i have such a girly little daughter. i promise, if we're ever at the same flea market, i'll save the good ones for you! You certainly hit the jackpot!!! Love those hats! What fun. Awesome finds, I'm quite envious! :) .... may I ask how you hang/display your mirrors (what type of holders/hooks you use to keep them on the wall)? Are you going to take the hats apart also? I collect all the same type items, except for the barettes which I don't find many of. Oh! Such luck you had! I love it! Love your flea market finds! My kind of old finds... I must dig out my childhood rhinestone barrette. 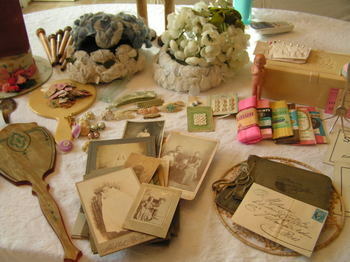 what fabulous finds - I am absolutely green - the letters, the dice oh my what treasure - and the photos are beautiful- eb. aaaah, can you hear me screaming!!! I am going wild over your awesome finds! Saw you through Jenny's blog. I love all of your treasures. 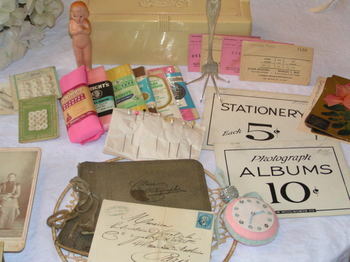 Many of them are things that I have rummaged for or would love to find at a flea market one day. Thanks!